The Cannes Film Festival has given a kick start & like every year it going to showcase immense talent from the movies from all around the world. The gorgeous and sultry Penelope Cruz wore a black color dress designed by vintage Chanel & made everyone go awe of her vogue. The next on our list is the red hot ARAYA A HARGATE, she chose to wear a Zuhair Murad dress in red color dress with thigh high slits with intricate details on the top. Her jewelry was complementing her look completely & we can’t stop praising. The next lady who stole our heart is Iriana Shyk, she wore a black tired tulip gown & made her way to the list of best dressed ladies of Cannes. 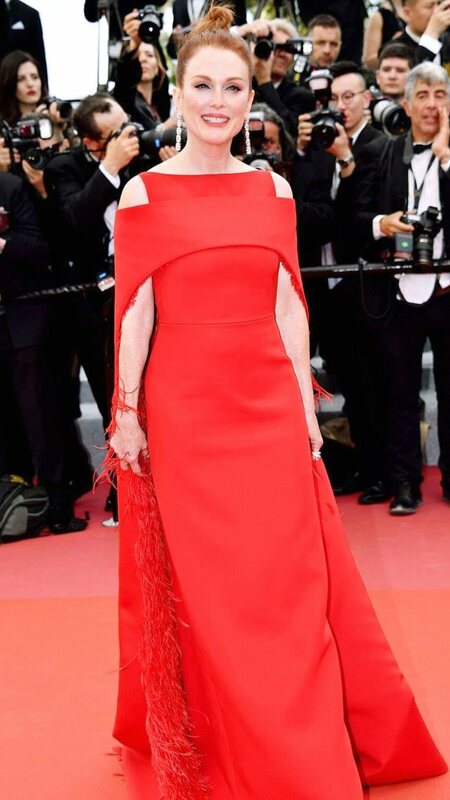 The next spot is won by the alluring Julianne Moore, she wore a red color dress by the designer Givenchy with the feather detailing at cape & looked magnetic with the enticing smile on her face. The last spot is acquired by our very own Bollywood diva, Kangana Ranaut, she gave us a flashback of the retro look with her hairstyle and managed to create a balance between the retro & contemporary look. She wore a designer Sabyasachi sequined saree in black color & looked drop dead gorgeous, we give a thumbs up to you Kangana.